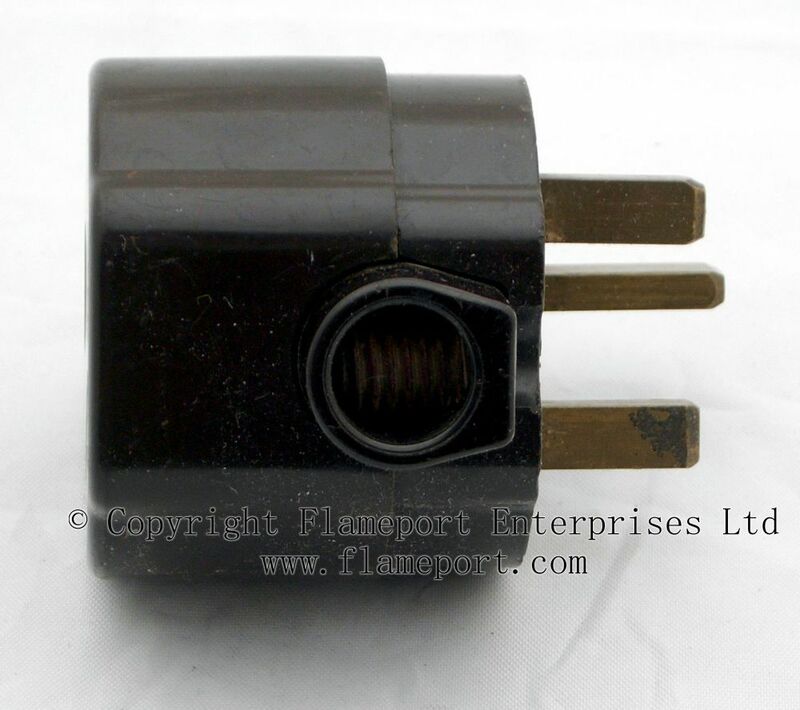 This is a 13A plug with a socket in the back, where another 13A plug could be inserted. 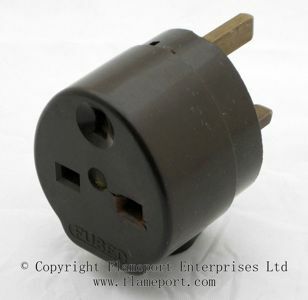 Yes, this is actually a plugsocket - unlike the socket outlet which plenty of people incorrectly call a plugsocket. The line hole on the socket is cracked and damaged, probably due to an overheating plug. The cord grip is a threaded plastic piece which presses directly onto the flex. 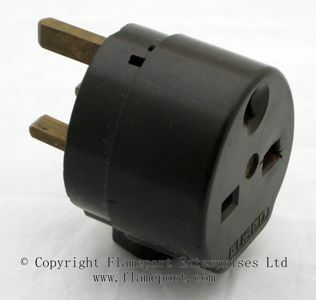 The grip protrudes significantly from the base of the plug, making it more likely to be broken off. Internally, the earth and neutral are directly connected through to the socket contacts. The fuse is connected to both the outgoing appliance flex and the line contact on the plug, avoiding the possibility of overloading. Although somewhat difficult to see, the fuse fits in the central rotating holder, with the incoming contact to the side of the line socket. The other side of the fuse connects at the bottom, with a brass strap from there to the wire terminal, and finally to the line socket contact. 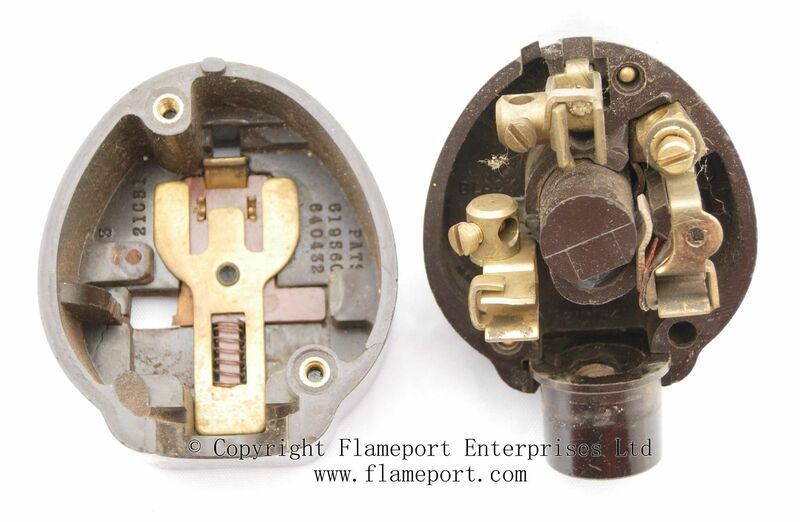 The socket terminal and top fuse contact are insulated by a thin piece of red coloured material. 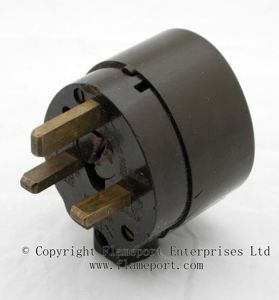 The fuseholder on this example is broken and jammed in position. The shutter over the line hole is also broken. 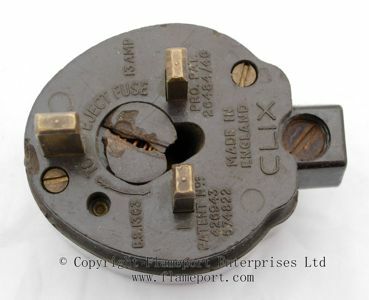 The fuse was originally removed by rotating the holder. This one is broken.